1960s: Man touches rocket booster tank. Man walks by rocket booster tank. 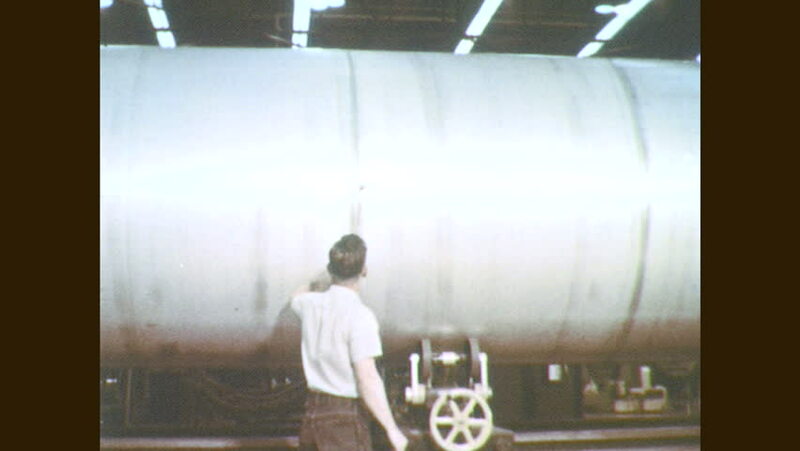 Man inspects interior rocket booster tank. hd01:20CIRCA 1920s - A man begins assembling a weapon from small factory parts. hd01:38CIRCA 1952 - Takako's student's older brother comes home and she chats with him, in Hiroshima. hd00:16São Paulo, Brazil, 1930s: Man sifts coffee beans on table, funnels them to canister, hands canister to man who sifts beans, picks ones out. Third man receives a canister, pours and sifts beans. hd00:151950s: Man in suit approaches Newton's cradle, picks up leftmost ball and drops it. Newton's cradle in motion. Man stops motion in Newton's Cradle, and then resumes it. hd00:221970s: Boy sits in chair and huffs paint. Teenage boy stands near friend and talks. Boy sprays chemical on sock.